Jared has been campaigning for the past year and a half. During that time, he met thousands of commuters at various Park-N-Rides in his district. This morning, we left for one final time to the Thornton Park-N-Ride to meet and greet with commuters and likely voters on the last day before the election. We were joined by Lisa, Jonathan, Sam and Gina. 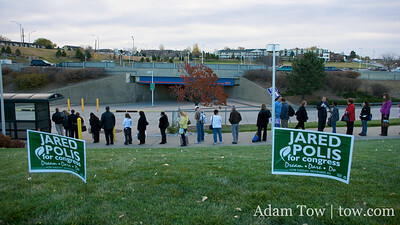 As at the previous Park-N-Ride that I photographed, a number of people had already voted, and many of them for Jared. I didn’t notice, however, a few tepid handshakes. Perhaps these people were going to vote for Jared’s opponent, Starin, tomorrow morning?